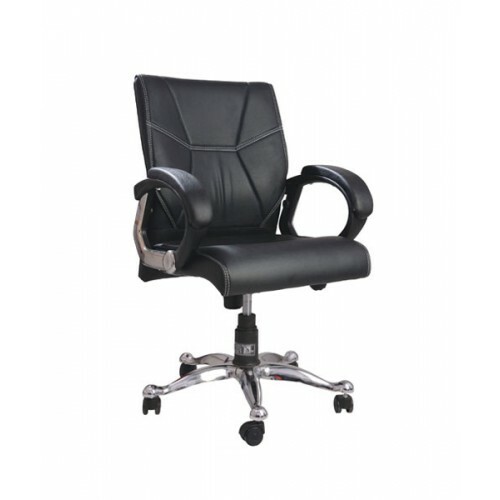 This compact medium back office chair is perfect for small offices and meeting rooms. The padded seat, back and armrests of the Compact Executive Chair mean that you can work in comfort for longer. The swivel mechanism with gas lift, adjustable seat height and provide an impressive level of customization comfort and makes the chair extremely mobile and ergonomic. The PU leather look gives this chair a sophisticated, professional appearance. The armrests covered by soft padding provides comfortable support, especially for sitting and back make the chair comfortable to sit in for long periods of time. The chair is designed with a leather look for your peace of mind. This chair provides optimum rest and support for sitting over long periods. It's also available in your choice color like red, white,blue,brown etc. with order.